The first 70 tons of damaged rice of Burmese origin of the cargo of 18,000 tons of the "Ocean Princess" which were landed in Côte d'Ivoire at the beginning of March were destroyed and on April 16 disposed of at the Kossihouen Landfill.Industry and Promotion. The rice was unloaded from March 11 to 18 at the port of Abidjan. Also the bags that contained the product were cremated. It will be necessary to destruct 500 to 100 tons per day of rice over a period of one month The bulkcarrier had been expelled from Togo, Guinea, Ghana and Senegal. The cargo had finally been unloaded in Côte d'Ivoire. Four analyzes were done by national and international laboratories before the rice was declared unfit for consumption. During this period, there was reported leakage of rice unsuitable for consumption of warehouses of the Port of Abidjan to shops. Togo has just banned the "Ocean Princess" from unloading its cargo of 18.000 tons rice. Before this decision of the Togolese authorities, the same measure had been taken by Guinea, which requested the return of the Burmese product to the supplier already on November 30, 2018 to the general manager of the company Huilerie de Guinée. The rice of dubious quality has taken the direction of Dakar for a few days. The vessel was in international waters after failing to land the product in neighboring countries. The ship has been actively monitored in international waters since its departure from the port of Lomé. On March 20 the bulkcarrier reached the Adidjan anchorage. The Guinean and Togolese authorities have banned the discharge of a shipment of rice aboard the "Ocean Princess" after it was unfit for consumption and of dubious quality. The bulkcarrier came from Yangon, Burma. The documentation provided by the ship was not in conformity, the technical services of the of the Ministry of the Agriculturecould not carry out the phytosanitary inspection of the cargo under the phytosanitary regulations in Togo. As a result, it was strictly forbidden for the vessel to unload the rice at the port of Lomé where it had arrived on Jan 6, 2019, with 18,104 tons of "Myanmar rice". 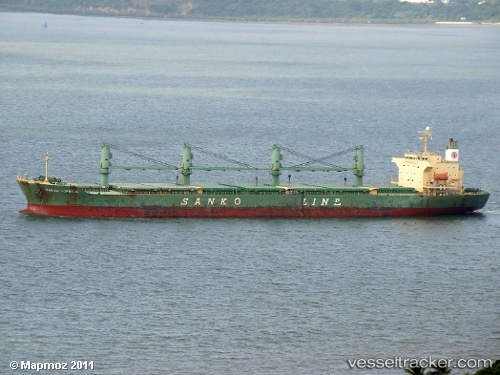 On Feb 13 the ship was still moored off the coast of Togo. The Guinean Minister of Commerce, Boubacar Barry, said the vessel carried 14,000 tons of "Indian rice" and 22,000 tons of "Burmese rice" with anomalies. He stated that the 14,000 tonnes of Indian rice were subject to administrative procedures and asked to return the 22,000 tonnes of Burmese rice to the supplier as it was moldy and unfit for consumption.